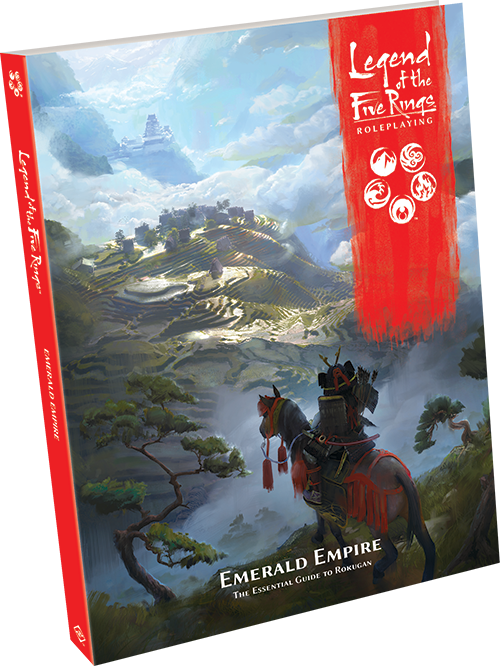 Travel to the famed palaces, cities, and harbor towns of Rokugan with Emerald Empire, a setting sourcebook for the Legend of the Five Rings Roleplaying Game. Each Great Clan molds their holdings in their own image, from the shadowed alleys of the City of Lies to the magnificent palaces of Kyūden Doji, to the tent city of Khanbulak that straddles the border between Rokugan and the plains beyond. In this article, we’ll preview some of the specific locations detailed in the book, and how Game Masters can use them in their own campaigns! 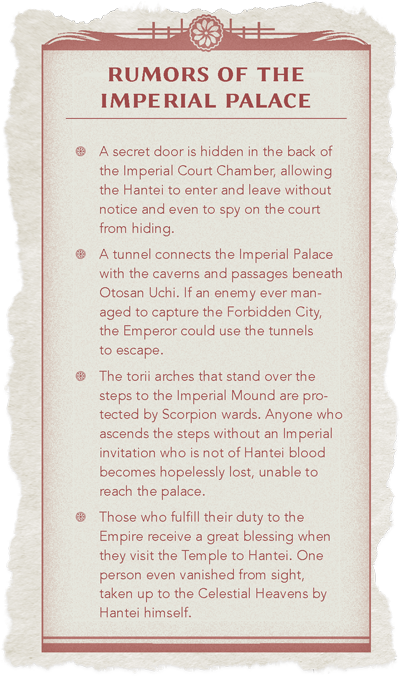 What challenges and intrigues await you in some of the most storied places in the Empire? Will your samurai be tempted by the pleasures of the Licensed Quarter in Ryokō Owari, or will you join the bands of rōnin protecting the City of the Rich Frog? Will you request the spirits’ blessing at the Shrine of the Ki-Rin, or attempt the journey to the legendary High House of Light? What manner of scoundrels and pirates might you encounter as you travel along the River of Gold, and what dangers lurk beneath the canopy of the Shinomen Forest? Emerald Empire highlights these and many more iconic locations, providing GMs with a stage on which to set their stories. A full-page map of Rokugan showcases the locations of the over twenty-four entries highlighted in the gazetteer sections of Emerald Empire. Each location description includes an overview of the location’s founding, its current political landscape, and its historical or cultural importance to the clan or Empire. Descriptions of the holding’s architecture, condition, and nearby geography provide the GM with cues to include when narrating the sights, scents, and sounds encountered by the player characters. 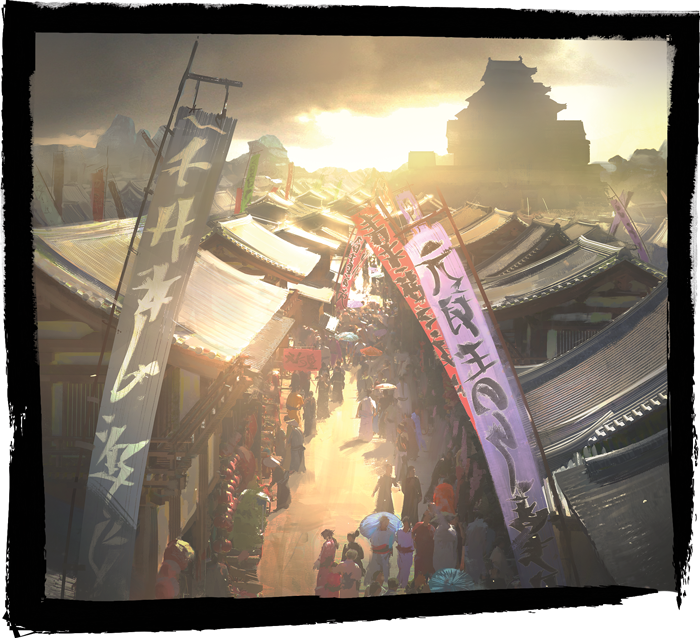 Each section also includes a discussion of the unique cultural elements to be found in that location, as well as some of the most famous landmarks, including city districts, tea and sake houses, gardens, and more secret holdings. The book also supplies GMs with snippets of gossip centered around each location—these can be used to lend local color to a place, or they could inspire you to spin the rumor into a plotline for your players to explore. Each location also includes the profile of a non-player character who might serve as an ally, rival, or a mixture of both to the players. These characters serve to supplement the list of NPCs already included in the Legend of the Five Rings Core Rulebook, now representing more specialized samurai and peasants, as well as the movers and shakers of the setting. From Go masters to acclaimed poets, city governors to guard captains, and warrior monks to tree-spirits, GMs can populate the world with dozens of interesting characters. In-depth discussions of the daily routines for different members of society also lets GMs breathe new life into their NPCs and evoke a realistic world. 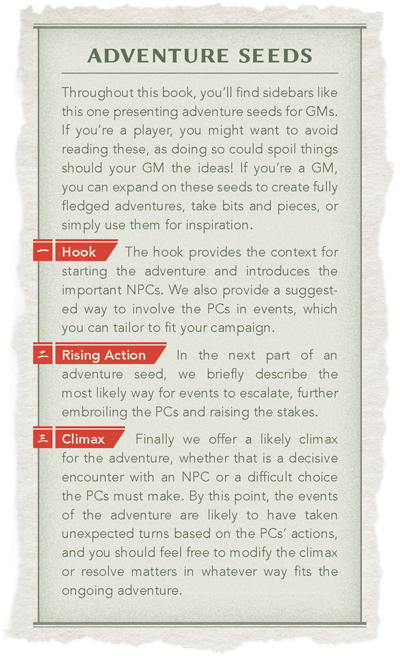 Finally, each location features adventure hooks to highlight the themes and secrets of a location, embroiling the PCs in a conflict that will challenge their skills and their dedication to their duty—or desires. In addition to the detailed gazetteer entries for specific locations, Emerald Empire also supplies generic maps of commonly visited locations that GMs can use in any city or town. Beautifully illustrated by Francesca Baerald, these lavishly detailed floor plans are meant to inspire GMs and help them describe the setting to their players. A total of eight labeled maps in this style can be found in this setting book, including an example castle, road station, and monastery, to name but a few. For example, the Estate of Emerald Magistrate Seppun Tatsuko showcases the layout of a mansion typically owned by members of her station. Built in the shinden-zukuri style, the multi-building, one-story complex features an entrance hall, courtyard, and audience hall to receive guests, which also doubles as a dining hall. A sweeping garden and the pavilion overlooking a pond are painstakingly maintained for the enjoyment of the magistrate and high-ranking visitors. Those who are “guests” because they are being held for trial for crimes committed against the Empire are appointed lodgings in the holding cells, watched over by a dedicated warden in a nearby guardhouse. For the family members of the magistrate and their servants, buildings offset from the main complex contain private rooms, the kitchen and larder, and the magistrate’s personal library and armory. 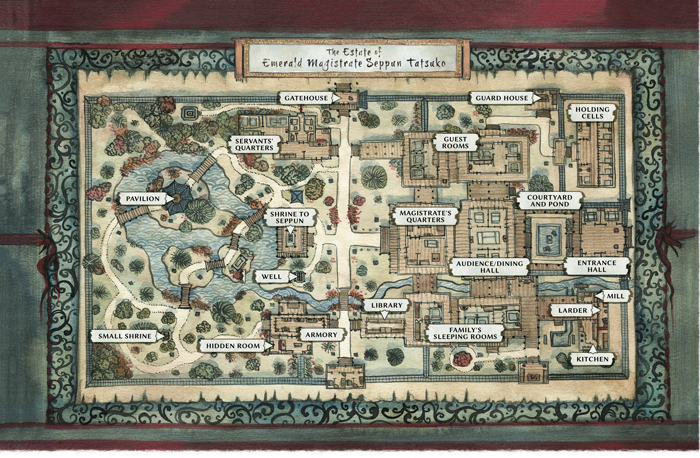 GMs can use this map as the foundation for creating their own magistrate’s mansion, or to represent the clan or Imperial magistrate’s dwelling in the city where they’ve set their campaign. Emerald Empire provides players, GMs, and fans of the setting with a guide to Rokugan that is a true companion to the Core Rulebook. The highlighted locations serve as a springboard for GMs wishing to base their campaigns around classic setting locales, and the writeups provide insight to players whose characters might have visited or even hailed from these places. The gazetteer sections showcase the diversity within Rokugan, and how the influence of the clans and the surrounding geography can mold similar places into very different shapes. Where in the Empire will your duty take you? Bring some of the most iconic locations in Rokugan to your tabletop with this setting sourcebook for the Legend of the Five Rings Roleplaying Game. It’s not too late to pre-order your copy of Emerald Empire (L5R04) from your local retailer or the Fantasy Flight Games webstore today!